This holiday season Brenda and I returned to a bi-annual holiday tradition: flying my airplane back east to spend the season with our families. Looking through my blog and old aviation pages, I see that I haven’t done one of these trips or reports in a while. Brenda’s family moved to Frisco, TX in the Dallas metro area and mine lives outside Asheville, NC. In the past, getting to Frisco (we technically land in McKinney) took 2 days and a second day from Dallas to Asheville. We usually stop first in Frisco before Christmas and spend a few days there before heading on to Asheville. We’ve stopped in Frisco on the way back before, but we don’t always do so. I write the reports from my perspective, and that perspective is the pilot’s perspective. I talk much more about flying the legs than about the joys of the holiday season. Of course, those are some of the joys of my holiday season. This is the first year that I’ve flown Slippy on a flight this long. Slippy is much faster, more powerful, and better equipped than my previous plane. This trip let me work a bunch of those features out. Off we go, after loading up the luggage and finishing up our last few obligations. Departure time is close to 8AM and my optimistic plan is to try to reach El Paso in one leg. I chose it because El Paso is a favorite stop from earlier trips and Slippy’s specs put it in reach under good conditions. I may yet make a one-hop trip to El Paso, but this was not that day. I have both detailed performance specifications and an engine monitor that tracks fuel usage in real time. This was one of the first times I’ve tried them out, and one of the points of this trip was to assess how reliable the tech was. The approach and landing were uneventful, though my radio communications were sloppy. I wound up a little tongue-tied and I always confuse Gateway and the nearby Chandler. Sigh. One of the key things I was testing out on this leg was how Slippy’s balance changed when I used the center tank. Slippy has 3 tanks, one of which is a 15 gallon (1 hour) tank in the center of the aircraft, though further back than the wing tanks. I’d studied how using that tank changed the handling characteristics, but it’s one of those things that it’s best to feel at some point. This landing was that point, and the handling characteristics were perfectly reasonable. One of the cool parts about this stop was sharing the pattern with a C-130. There also seems to be an aerobatics/emergency upset school at gateway, and we saw some of their planes on the ramp. And so we fuel up and head out. Real fuel usage was in line with the tech’s prediction, which was also reassuring. Midland is another old friend on our trips. It’s a well appointed airport that’s a short hop from our final destination in McKinney Texas. 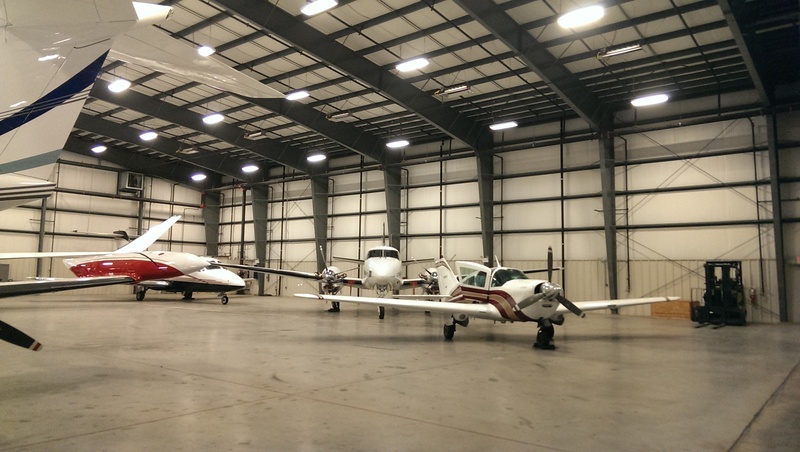 Midland’s a great place to fill up and prepare for the transition across Dallas’s complex airspace. 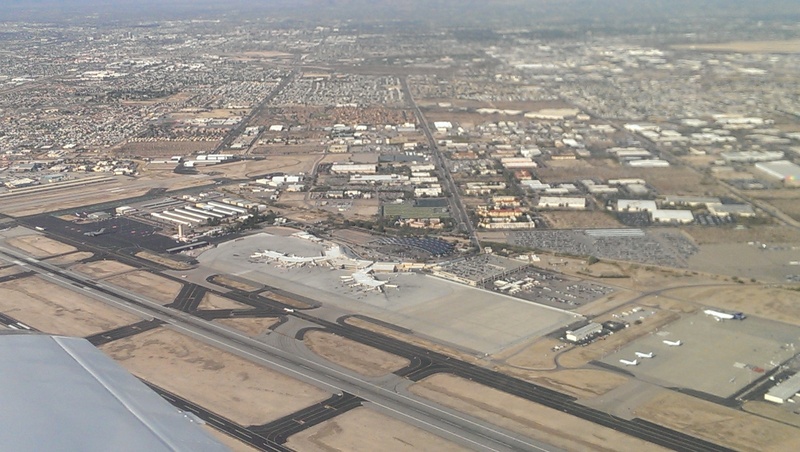 This hop started by avoiding some parachute jumping south of Phoenix. I’ve transitioned that area a few times before and knew most of the hot spots. It was the first time Brenda heard an Air Traffic Controller refer to Eloy airport. She asked if it was named after the alien race in H. G. Wells‘s The Time Machine. “Y” not “I”, but she is totally awesome. In general, Western Arizona, New Mexico, and West Texas are not filled with things to see from the air. I’ve made the trip enough that I do have some, um, unusual landmarks I like to see. There is a huge smokestack on a building outside Winkleman AZ that I look for. Since the last time I’ve been by, they added a huge tailings pond there. I was surprised to see it, and I’m curious about what additional mining is doing to the area. I googled the area to figure out what it was, and the first image returned was a picket line, so I don’t think things have been entirely smooth. The next excellent landmark is a tethered balloon south of Demming, NM. There’s nothing particular to it (except that you shouldn’t hit the tether). The purpose of the thing is to take weather observations, and it’s very well marked. We’ve never got a really good picture of it, but I always love to see it. 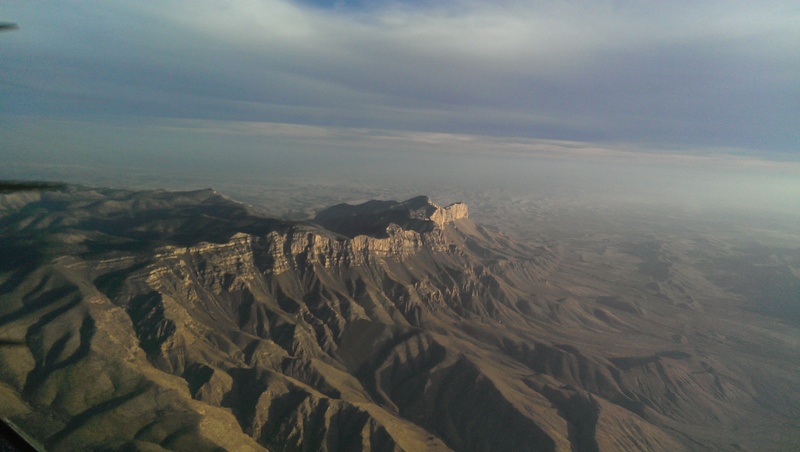 Then we have El Paso and the beautiful Guadalupe Mountains. I have a strange affection for these mountains, partially because they look great. When there’s any wind out here, they can also generate a lot of turbulence, though primarily coming the other way. That’s them above. There are a few more things to see between El Paso and Midland, but nothing super exciting. Even by my standards. The approach and landing to Midland was direct and cool. It was done in the dark, though not technically a night landing. Flying east in the winter features the offsetting effects of good winds and bad clocks. Prevailing winds are usually strong and on the tail – though they were not on our first leg. Clocks are against us, meaning that we’re generally flying into encroaching darkness. Both of these are on display this leg. We launched IFR on a short leg to McKinney. The leg itself was clear and simple. Visual conditions and smooth air all the way. One of the interesting things about West Texas is the appearance of large wind farms for power. At night you can’t see the windmills directly, but the farms are easy to spot. They’re generally topped with slowly flashing red lights to warn planes and all the lights flash synchronously. It’s a striking and easy to identify feature. 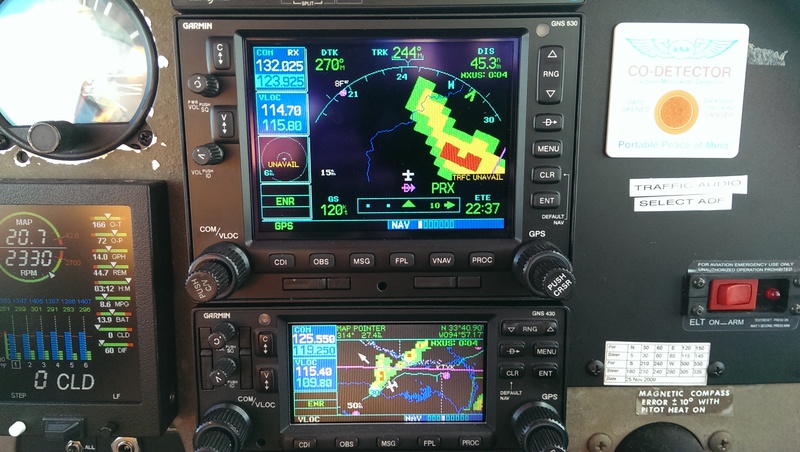 The Dallas airspace is big and busy, but we were able to slide in pretty easily under instrument rules. There was a little handoff glitch and I had some trouble picking the airport out of the city lights. Overall things went smoothly, and we handed Slippy off to the excellent McKinney Air Center. Brenda’s mom greeted us with takeout Chinese food and we began a great holiday stay in Frisco. We enjoyed seeing family and spending time in town for a couple days – the Frisco Public Library is incredible. Weather was advancing from the west, so we cut our visit back a day and set out for Asheville with the plan to come back and spend a day on the return (spoiler alert: that plan worked). Texas weather is tricky to forecast. McKinney forecasts have probably burned me more often than any I’ve dealt with regularly, so when I saw a well-defined weather system advancing from the west, I decided we’d get out ahead of it. There wasn’t anything forecast that would have been unflyable, but given the uncertainly I opted to get out early. When we did leave, we had beautiful weather and clear skies. I’d planned the route to avoid some military airspace (MOAs) along the way. This put a northbound dogleg into our route that seemed to surprise some of the controllers. At least two that we talked to asked why the dogleg was there. MOAs are interesting (to pilots) because there are no restrictions on flying through them under visual rules, though you’re potentially sharing the space with some powerful playmates. I do fly through them, but I’ve also had the experience of being politely ushered out of them in this part of the world. It was too nice a day to worry about cutting the corner. Huntsville is a good stop for us when flying GA. From our perspective there are no frills, but the FBO is friendly and efficient. We spent a few extra minutes while Brenda took care of some work via their WiFi. I was also pleased to see another Viking on the ramp. A search on the Viking Pilots Forum led me to the info that the plane I saw is this one. As everyone says when they point to it, don’t try that at home. I don’t, either, but it’ll give you some faith in the airframe. (Yes, it’s a stock Viking in the video). With all that business completed, we were off to Asheville, our farthest point East. 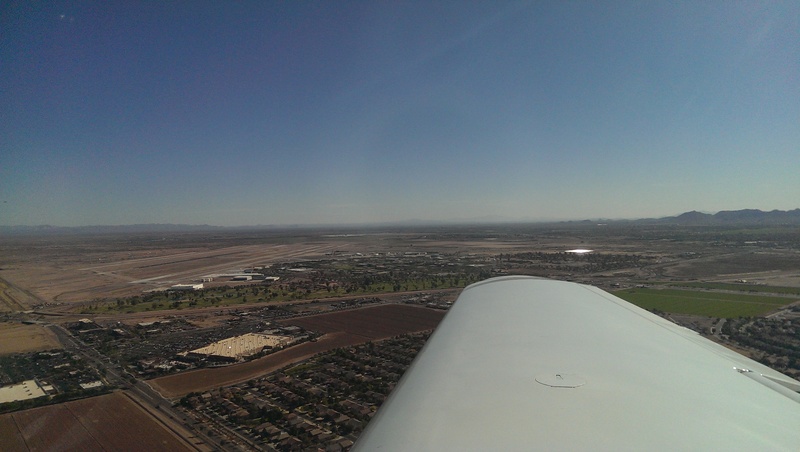 Skies were clear and a strong tailwind shortened an already quick trip. We zoomed over familiar terrain and aviation landmarks – I always love to know I’m passing the Choo Choo VOR outside Chattanooga. While the mountains in the East are much lower than the ones out in the West, they’re nothing to sneeze at. Strong winds in the air over mountainous terrain can mean tricky conditions for landing. The weather observation in Asheville bore that out and I prepared for a landing in strong gusty winds. I guess I should always psych myself up for landing; this was easily my best of the trip. It was strange and wonderful to reach Asheville while it was still light, and we spent a great couple days exchanging gifts, seeing family, and eating way too many cookies. The weather system that was behind us in Dallas showed no sign of wanting to head out to the Atlantic, and Monday found us getting ready to meet it along the Texas border. I was motivated to catch it there rather than in the mountains near Asheville because it gives us a few more options and the higher terrain can make storms more intense. But before we could meet the storms, we were off to Greenwood Airport in Mississippi. It’s another stop we’ve made before and was well placed to put us on a good line to get through the storms and fuel up before meeting them. While Slippy doesn’t need any particular babying, I’ve been trying to keep her hangared even while traveling. She definitely got to share space with some tony friends in Asheville, which is what the image for this leg captures. This leg also presented us with our first instrument conditions of the trip. 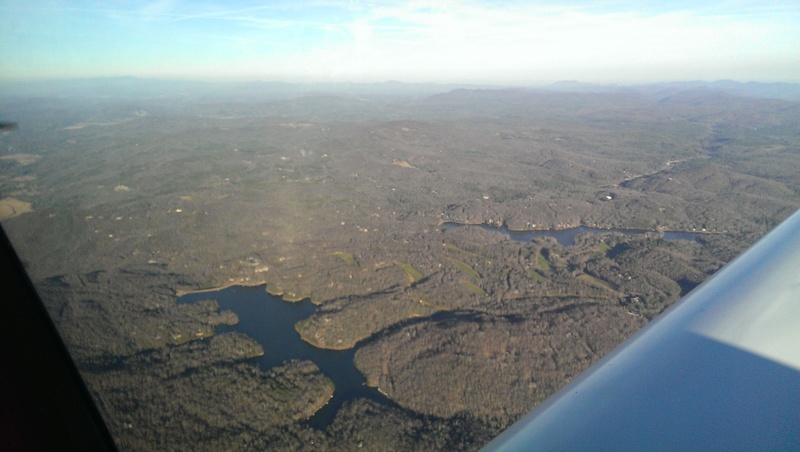 Asheville had a fairly low overcast – a few hundred feet – with layers of stratus forecast until we got close to GWO. It was warm in Asheville and there was no forecast threat of icing (though ask me about icing forecasts sometime). These conditions are my idea of fun. Climbout was mostly interesting for the sights. Brenda and I both find flying through clouds to be beautiful, and the layers on this leg did not disappoint. It’s beautiful and a little eerie to be the filling in a cloud sandwich. Try though we might, neither of us has ever really captured that experience in an image. The rest of the hop was straightforward and enjoyable. Especially once I saw that the outside air temperature was still well above freezing at our cruising altitude. I distrust forecasts, but thermometers I believe. We tucked in to GWO and got ready for the most interesting leg of the trip. Greenwood seemed to be having telephone troubles. We weren’t able to directly charge my credit card, and my cell phone couldn’t get enough coverage to file my flight plan via the Internet. I made a phone call and both filed a flight plan and got a weather briefing the old fashioned way. I should say a few things about how pilots – well, this pilot, anyway – prepares to proceed through forecast weather like we were going to pass through. First, the weather was a line of thunderstorms that were connected, but not terribly intense. They were displaying predominantly moderate RADAR echos and no sign of the kind of convection that would produce a tornado or similar violent phenomenon. The bands were well defined enough to allow me to believe that we could skirt them without entering any cells. Slippy is very well equipped, with a feed of NEXRAD weather data. Optimists call that feed a near-real-time feed. I don’t, because I want to keep my understanding of its limitations in the front of my mind, but it does provide very useful information. That’s where I begin, by reviewing what I know and what my resources are. Then I work through the likely situations and plan actions broadly. While one has to be ready to accommodate what the weather throws up, I find it helpful to have a menu of plans pre-loaded in my mind. 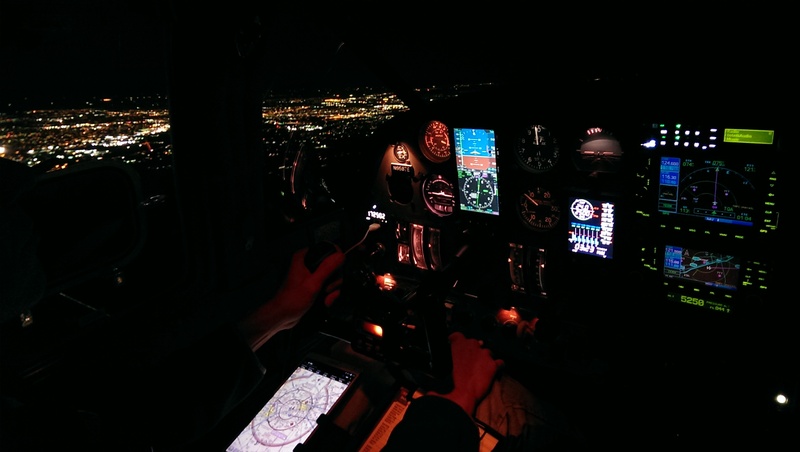 In this case, I reviewed the broad outlines of the reported storms, planning the outlines of my route through them and reminded myself that if conditions are worse than expected, backing out and landing is the plan. There are two parts to that plan: being ready to execute it and keeping it available. The second means keeping that worst case plan feasible – don’t get locked in without a way out. It’s possible to fail at keeping an “out” open, but keeping it in the front of my mind helps. The first rule I have always used from the first day I was a captain, way back in the “brown hair days” is a simple one: Whoever is the most scared wins. Garrison’s being funny (or pilot-funny), but his point is one I believe. Brenda’s been on a lot of trips with me, and when she’s nervous, I need to at least take a second look at the world. Besides which, we travel this way for fun; avoidably scaring any passenger is a sign of a developing accident chain. Avoidably scaring the love of my life has considerably worse implications. With the flight plan filed and Slippy fueled we were off. I’d forgotten how casual departures from small southern airports can be. In LA, it often seems like each controller needs to tweak the clearance a little and the eventual route can be dotted with small changes. Even Asheville added a standard departure (SID). Here the clearance was basically “as filed; clear for takeoff.” I’d forgotten how much I like that about the South. I’m pretty sure that there are no spoilers when I say we got through the line. Better than that, we were able to get through without any kind of incident. There were layers of clouds to negotiate, but while picking our way through the line of storms, I was able to keep them ins sight the whole time. The NEXRAD data was great to have, but the Mark I Eyeball remained my primary avoidance mechanism. That’s definitely the way I like it, to the point where I’d probably begin taking an out if I lost that option. A side effect of remaining in conditions where we could see was that we got to see. Flying through these clouds afforded spectacular views. Sleipnir took us near Thor‘s domain with great panache. I spent most of the time turning the views into piloting cues, but even so the experience was memorable. As we exited the final line, Brenda pointed out the rainbow in the second image. As great as I think that image is, the reality of it was much more spectacular. Trips by small plane give us chances to see the world in unique ways, and this was a great example. And because I’m a nerd, I also have to point out that the image includes two distinct propeller shadows on the wing, which is an artifact of the digital camera scanning rate. Cool. The descent into McKinney was much less eventful, though we did get to spend a little more time in the clouds. Arriving in daylight was a weird, but pleasant. Brenda’s mom met us again and this time took us to a fabulous Italian restaurant. Go see them if you’re in town, but expect a wait; it’s worth it. We hung out for a day with Brenda’s family, catching up on the day we lost when we left early. Great fun (and great movies) as always. This looks like just retracing the steps we took getting to Dallas, but this is technically a diversion. I filed an IFR flight plan to El Paso, but decided not to fight questionable headwinds in getting there. El Paso seems determined to keep us out. Then there’s that IFR thing. McKinney had a high overcast, and we needed to transition the DFW airspace again anyway, so IFR it was. Beyond that, the stratus layer extended a fair ways west (at least to Abilene) and my IFR coverage philosophy is always that it’s better to have and not need than need and not have. So I filed. No surprises getting out. No ice in the clouds, clear conditions on top, some rising startus, but it basically cleared as expected going west. As we left the DFW Class B, the controllers were happy to provide us with direct clearances to our destination. I got one early enough that I toyed with the idea of making El Paso, but eventually did decide to divert to Midland. And the controller cleared us directly there, too. Once the undercast cleared it was good to see all the landmarks I’d missed coming the other way. 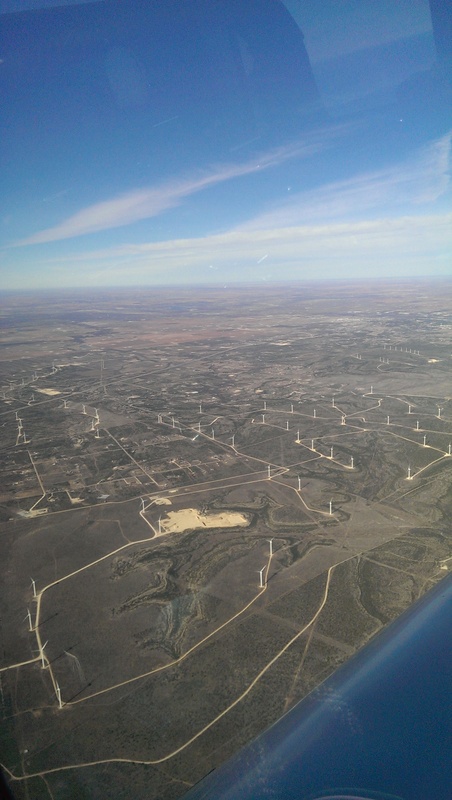 There are a lot more windmills than before, but otherwise it remains West Texas all over. Approach and landing to Midland was in clear skies. During fueling we did have a small incident. Slippy’s gas caps have both a stopper that seals the tank, and a cover flush with the wing surface. In the process of fueling up, the line guys had a spring on one of the catches on the cover snap. They let me know right away and I was able to bend a spring into place to hold the cap safely shut. I doubt they did anything in particular to cause it, just time and age. With the tanks buttoned up, we were off into clear blue skies. Once again, we were out over some very empty spaces in the West. This route took us further south than our trip out, which provided a little variety. The mountains southwest of the Tuscon area are quite beautiful. And Simpsons fans might be amused to know that there is a private Rancho Relaxo airport out here. This was also the leg where I realized just how much Slippy’s weight and power make her more capable than 32169. On this leg, we passed by the Guadelupes against a strong wind, which has always resulted in some struggle. I’ve battled some of the strongest up- and downdrafts of my piloting experience here. With the kinds of winds we had on this leg, the drafts have been substantial. 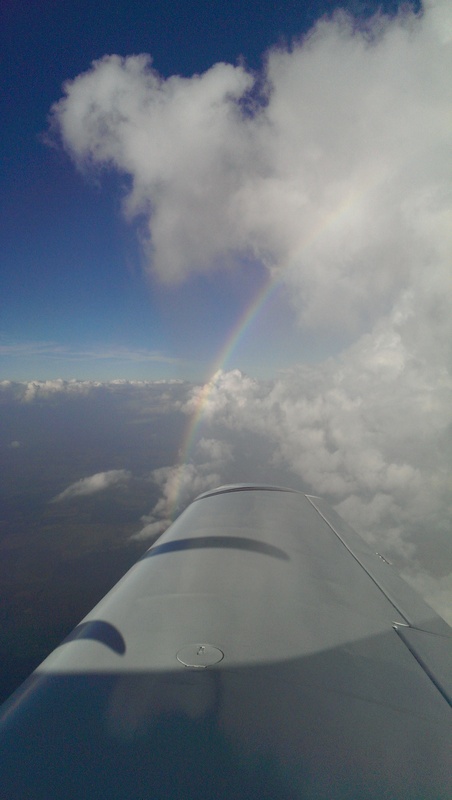 In the Archer this means fighting by increasing the power to resist powerful downdrafts and by reducing power to keep equivalent updrafts from either overtaxing the propeller and engine or accepting a large altitude deviation. In this area I’ve had drafts so powerful there simply wasn’t enough engine power to successfully resist a draft. It’s a kind of flying I hate, fiddling with configuration while performance becomes uncertain (meaning one assumes it to be bad). Flying through the same area under conditions that I would have expected to cause trouble only resulted in small altitude changes. I’d almost missed the effect until I recalled how hard I’d needed to work when I came through the area on earlier trips. Once I realized what was going on, I was able to reduce the small excursions with small trim changes. I’d considered Tuscon as a stopping point on the way out, but my initial destination for this leg was a smaller nearby airport, Ryan Field. As we got closer the ATIS informed us that basically all the services were closed, so Tuscon jumped to the head of the line. What an amazing airport! The controllers were friendly and helpful, there were F-16’s in the pattern, a 747 on approach, and a gorgeous old terminal on the ground. I don’t know why I haven’t stopped here before, but I’m happy to have rectified that. I didn’t confirm that the stoppers were sealed before takeoff. Because I’ve had leaking gas caps before I do look at the wings on climbout. I saw the gas, put 2 and 2 together and headed back to TUS. Everyone at the FBO was extremely apologetic, but honestly it wasn’t their fault at all. I gave bad instructions and then didn’t do a complete enough walk around. I don’t intend to let the second happen again. The upside is that we did get to see some more of the sights at TUS. With tanks refilled (and properly stoppered) we were off to home. The flight was joyfully uneventful. The last leg is always one of my favorites as I wrap myself in my familiar airspace once again. The sights and sounds of home are easily as comforting in the air as on the ground. 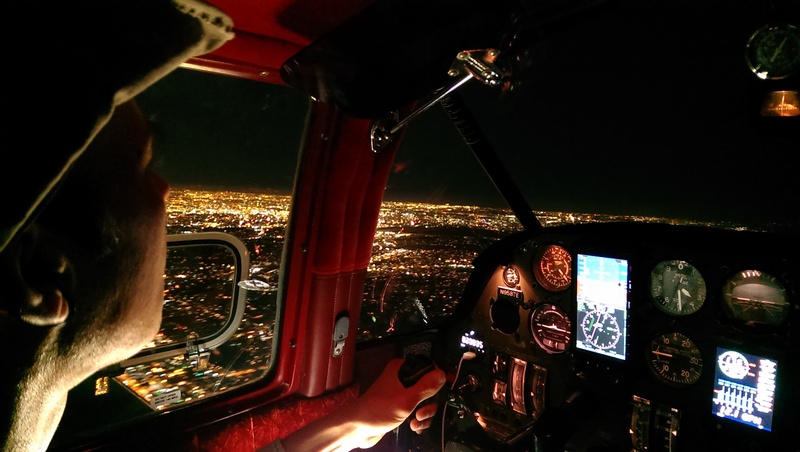 We finished our trip with a night landing in clear skies at Santa Monica. I should really confer with my friend Jeff before I write any of these capsules. I’m frequently lukewarm on a book until I tell him about what I found out from reading it. This is written after such a session, so I may actually be too excited about James Hamilton-Patterson’s Marked For Death. Marked is a history of World War I aviation from a British author and perspective. That’s an unusual one for me, as most of what I’ve read has been from the American point of view (or from American or German participants.) Hamilton-Patterson is very explicit that Marked is not a linear narrative of the war, but a ramble through topics about WWI aviation that interest him and that have been under-represented. It’s an interesting set of topics, and clearly of our modern era. He spends his time talking about how the UK bureaucracy inhibited adoption and development of aviation early in the war, some under-explicated specifics of the aircraft design, the structure of flight training, and aeromedical issues. One gets the sense that he’s a pilot, as many of these issues are hot buttons in our fraternity. It was a pleasure to learn more about many of them. While I did enjoy the ramble, the lack of narrative focus did allow some of the chapters to drag. I’m largely a motivated reader on many of these topics, and I felt the momentum flag at several points. Overall, Hamilton-Patterson brings a fresh perspective and solid research to under reported topics in WWI aviation. I’ve been meaning to post this for a while, but life intervenes. I’ve made an odd impact (ha, ha) on the LA biking and aviation worlds. 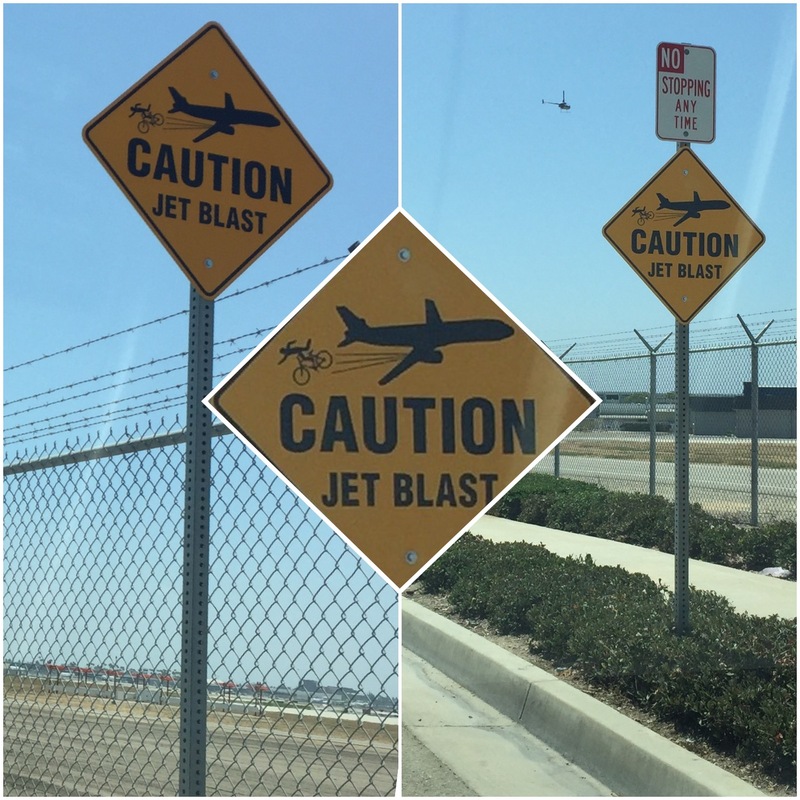 As readers may recall, I had a pretty exciting wake turbulence encounter in a construction zone near LAX this year. I mentioned it to Ted Rogers who runs the spectacular Biking in LA blog, and he posted it. A few weeks later, the I saw this update. Here’s a link to the sign. I never expected that my worst wake turbulence encounter would be on a bicycle. I’ve been biking to work pretty regularly the last week or two, and honestly one of the highlights has been going past LAX airport. I’m way too much of an aviation geek not to enjoy being close to the big iron. Aviation Blvd. goes right behind the runways and has bike lanes. I get excited when I hear a jet push in the power levers and take off. I’ll stop to watch from now on. I was coming home Thursday night (19 May) when I heard an American Airlines jet firing up its engines and taking off. I’m crossing behind it, and I’m assuming my face looked like Tom Cruise’s in Top Gun when he’s pacing the F-15 on his motorcycle. Then it got windy. I began to realize that I was moving laterally toward the curb and didn’t have enough power to stay on the road. I hit the curb and wend down hard on my side. Folks who know my history can imagine that I was extremely concerned when my hip hit concrete (as did my helmet). It’s not like there’s even a lot of concrete there, but evidently I’m a concrete-seeking missile. The adamantium inserts held and I rode away with road rash (contusions) and some bruises. I did need to straighten the trucker’s handle bars. Two very kind people did stop to make sure I was OK. And I was delighted to tell them I was fine. I suspect I was the most cheerful person either had seen crawl from a bicycle wreck, but I was experiencing the simple joys of femurs bearing weight. It’s nice to know people will stop to help a stranger. I’m much happier I didn’t need it this time. One woman said that she felt her car (a BMW MINI) blow right as well – “a gust of wind” she said. “It was the jet, ” I told her and the light dawned. Anyway, I’ll be being more careful and I expect to be biking around again Monday. I was very stiff and sore Friday. Of course I filed an ASARS. I’ve mentioned my new airplane a couple times on here, though not as often as I probably should have. I’ve omitted a whole saga with getting a brake leak fixed and a particularly exciting go-around caused because I let some pilot-induced oscillations get the better of me on the ground. Today’s post is where I come clean about another facet of the aircraft and my relation to it. I seem to have given her a name. I haven’t named any of my previous vehicles. Not even my beloved Archer on which I cut my aviation teeth. I laways referred to her by her callsign or as “The Archer.” Fanciful names were not for me. This plane is different. It’s quirky nature and charmed life combined in my head to form a name. This happened without my intention – or really permission. I slowly started thinking of her as Sleipnir. If you’re not a comics fan or familiar with Norse mythology, that’s the name of Odin‘s eight-legged flying horse. Sleipnir is called the best of all horses, and that’s how I think of the Viking. It stuck in my head and it’s become the name of the plane to me. I spent most of the day yesterday with my instructor doing more transition training. I’m still metaphorically clawing my way toward the left seat from the tail as I try to internalize all the complex and high performance operating procedures. I did perform a feat that qualifies as a landing and not an ugly arrival saved by my instructor. That made me feel undeniably better. After we stopped for lunch, we started back around the pattern at Camarillo for a few more landings, and noticed that the alternator was no longer charging the battery. We shed load landed and tried to debug, to no avail. The fine folks at Camarillo Air Service sent over an electrical tech to try to get us on our way, but there did not seem to be a quick fix in the offing. We had to leave the Viking with them. Their fellow – Harvey – was one of those fine, competent, eccentric people that one gets to meet in GA. He went out of his way to help us at every opportunity, but it was not to be. While I was working with Harvey to arrange for further debugging (and a probable alternator replacement) my instructor went off to look for car rentals. And here we lucked out. Nick, my instructor, somehow discovered that Patrick – a pilot who flies out of SMO – was on his way back in his Comanche. Patrick more than graciously invited us to hop in the Comanche and fly back with him. Even more graciously, he let Nick fly her most of the way home. We exchanged numbers and e-mail addresses and hopefully I’ll get a chance to return the favor someday. So, training was cut short by an inconvenience, but it turned into more of an adventure. The Viking continues to be a charmed creature that leads me into interesting places. Nick’s off at his day job for a few days and then we retrieve the Viking and I get back to clawing. After a few weeks of moving money and airplanes and matching schedules, I started actually flying my new Super Viking today. It’s a big jump from my Archer to a high performance, complex aircraft with a full complement of quirks as well. I’ve been reading and preparing as much as possible, but shaking hands with 300 horses for the first time is pretty exciting no matter how you slice it. The first day went as well as I could reasonably have expected. 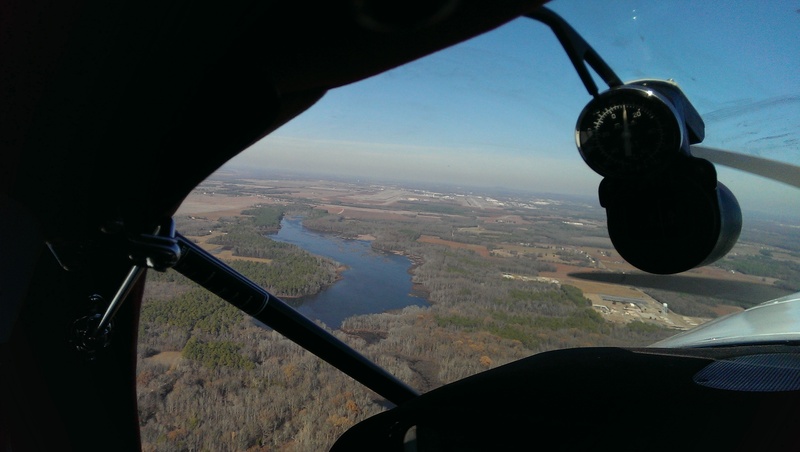 I wasn’t an instant natural, and my flight instructor kept me from serious trouble more than once. He and I seem to be developing a reasonable rapport. We’re both figuring out how the other works best. I’m getting a lot out of his Viking experience and teaching skills. We both recognize it’s a big hill to climb and I think we’re up to the challenge. I’m still feeling the Viking out, but so far it’s been a great plane. It has plenty of unique characteristics. The good ones are very good, and the bad ones – so far – are mostly just endearing. I’m very happy with my choice to join the Bellanca family. Tomorrow is another day of trying to claw my way from being far behind the Viking to getting ahead of it. I’m looking forward to the challenge.